Features: Auto-dial up to 6 phone numbers, and 10 second voice alert; Simple to operate, 8 zone control panel, multiple armed mode (Away/Home); Armed/disarmed/Listen-in by remote control or host's keypad; Monitor living surroundings, owner can listen into the conversation of the intruders. Alarm telephone priority, be able to dial to alarm when the line is busy. Phone line cut and damage alarming, if the telephone line is cut off, the siren will alarm automatically. 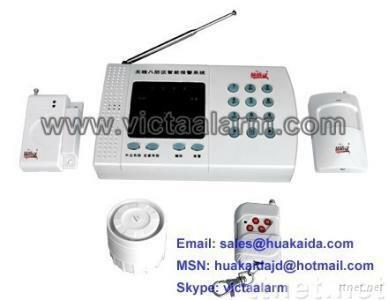 Audible/Mute Siren, Silent reporting to preset phone numbers with recorded voice message and/or audible siren alarm; Freely set the duration of the Siren and ringing mode; Adjustable siren sound; Can work with Monitor Center Station. Power-off protection. The system will store your Settings. So you don't need to set it again after the power on; Back-up UPS provides power to the system for 24 hours. Thunder Prevention.